On July 17 at approximately 11:30 p.m. Calcasieu Parish Sheriff’s Office deputies were dispatched to a local pharmacy on Country Club Road in Lake Charles for an alarm activation. During the initial investigation detectives learned from video surveillance that a man broke a window at the business and gained entry inside. Once inside he stole several prescription medications. While breaking the window the suspect received a cut and detectives were able to collect DNA evidence at the scene. During further investigation, detectives submitted the DNA to the Southwest Louisiana Crime Lab for processing. The SWLA Crime Lab submitted the sample into Combined DNA Index System (CODIS). 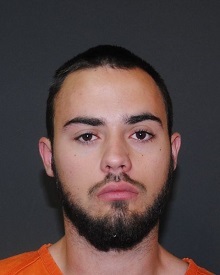 Detectives received notification that the DNA was a match for Brendan J. Giles, 20, 145 Victoria Drive, Lake Charles. On December 6 Judge Michael Canaday signed a warrant in the amount of $62,000 for Giles’ arrest. Giles was located later the same day at his residence and arrested and booked into the Calcasieu Correctional Center and charged with theft under $750; simple burglary of a pharmacy; and simple criminal damage to property. CPSO Detective Roy Pesson is the lead investigator on this case.